For the illusion, see Chinese linking rings. 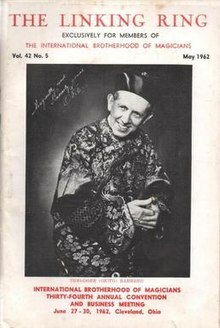 The Linking Ring is a monthly print magic magazine published by the International Brotherhood of Magicians (IBM) for its members since 1922. In 2007, Samuel Patrick Smith, a magician, author and publisher based in Eustis, Florida, became executive editor of the magazine. Dr. Robert A. Escher, Jr.
Nelson Hahne did not actually appear on the cover of the December 2007 Linking Ring, but rather an illustration drawn using his style appears on the cover of that issue. The "Cover Story" within that issue, however, discusses the life and contributions of Mr. Hahne to the magic world. Kristen Johnson followed in the footsteps of her mother Sunny Johnson, who appeared on the cover in March 2002. Hocus In Focus is the journal review section, listing reviews of a wide array of books, marketed effects and utility devices as well as magic related videos. Come A Little Closer A column which ran during the 1970s, heavily focused on close up magic; written by Rick Johnsson. Hocus Pocus Parade is the title of a regular column which appears in The Linking Ring, published by The International Brotherhood of Magicians. Although the table of contents usually lists the specific contributing magician's name (e.g. "Max Maven One Man Parade"). the column itself is still named Hocus Pocus Parade. Ring Reports is a collection of monthly reports, submitted by the Ring Reporters for each respective IBM Ring. Potter's Bar – a series of columns included 1952-1969 by Jack Potter giving bibliographic references to periodical and book descriptions of magical effects by category. They were later collected and published as The Master Index to Magic in Print. ^ Patrick Smith, Samuel (September 2012). "The Linking Ring History". The International Brotherhood of Magicians. ^ "Cover page". The Linking Ring. The International Brotherhood of Magicians. 57 (4): 1. April 1977. ^ "Cover page". The Linking Ring. The International Brotherhood of Magicians. 57 (1): 1. January 1977. ^ "Cover page". The Linking Ring. The International Brotherhood of Magicians. 62 (2): 1. February 1982. ^ "Cover page". The Linking Ring. The International Brotherhood of Magicians. 88 (8): 1. August 2008. ^ "Cover page". The Linking Ring. The International Brotherhood of Magicians. 76 (7): 1. July 1996. ^ "Cover page". The Linking Ring. The International Brotherhood of Magicians. 57 (11): 1. November 1977. ^ "Cover page". The Linking Ring. The International Brotherhood of Magicians. 80 (9): 1. September 2000. ^ "Cover page". The Linking Ring. The International Brotherhood of Magicians. 65 (3): 1. March 1985. ^ "Cover page". The Linking Ring. The International Brotherhood of Magicians. 87 (5): 1. May 2007. ^ "Cover page". The Linking Ring. The International Brotherhood of Magicians. 58. ^ "Cover page". The Linking Ring. The International Brotherhood of Magicians. 58 (11): 42, 43, 55. November 1978. ^ "Cover page". The Linking Ring. 90 (5): 1. May 2010. ^ "Cover page". The Linking Ring. The International Brotherhood of Magicians. 89 (6). June 2009. ^ "Cover page". The Linking Ring. The International Brotherhood of Magicians. 71 (3). March 1991. ^ "Cover page". The Linking Ring. The International Brotherhood of Magicians. 88 (3): 1. March 2008. ^ "Cover page". The Linking Ring. The International Brotherhood of Magicians. 64 (9): 1. September 1984. ^ "Cover page". The Linking Ring. The International Brotherhood of Magicians. 93 (8): 1. August 2013. ^ "Cover Page". The Linking Ring. The International Brotherhood of Magicians. 80 (1): 1. January 2000. ^ "Cover Page". The Linking Ring. The International Brotherhood of Magicians. 75 (5): 1. May 1999. ^ "Cover Page". The Linking Ring. The International Brotherhood of Magicians. 80 (2): 1. February 2000. ^ "Cover page". The Linking Ring. The International Brotherhood of Magicians. 74 (5): 1. May 1994. ^ "Cover page". The Linking Ring. The International Brotherhood of Magicians. 78 (4): 1. April 1998. ^ "Cover page". The Linking Ring. The International Brotherhood of Magicians. 58 (7): 42–43. July 1978. ^ "Jon Racherbaumer: One Man Parade 2". The Linking Ring. The International Brotherhood of Magicians. 89 (10): 77–95. October 2009. ^ "Cover page". The Linking Ring. The International Brotherhood of Magicians. 74 (9): 1. September 1994. ^ "Cover page". The Linking Ring. The International Brotherhood of Magicians. 87 (10): 1. October 2007. ^ "Cover page". The Linking Ring. The International Brotherhood of Magicians. 57 (2): 1. February 1977. ^ "Cover page". The Linking Ring. The International Brotherhood of Magicians. 78 (9): 1. September 1998. ^ "Our Cover: Harold Twaddle". The Linking Ring. The International Brotherhood of Magicians. 72 (6): 75. June 1992. ^ "Cover page". The Linking Ring. The International Brotherhood of Magicians. 81 (4): 1. April 2001. ^ "Cover page". The Linking Ring. The International Brotherhood of Magicians. 95 (9): 1. September 2015. ^ "Hocus In Focus". The Linking Ring. The International Brotherhood of Magicians. 80 (1): 120–126. January 2000. ^ "Come A Little Closer". The Linking Ring. The International Brotherhood of Magicians. 58 (7): 73–75. July 1978. ^ "Table of Contents". The Linking Ring. The International Brotherhood of Magicians. 80 (2): 5. February 2000. ^ "Copyright page". The Linking Ring. The International Brotherhood of Magicians. 78 (3): 4. March 1998. ^ "Copyright page". The Linking Ring. The International Brotherhood of Magicians. 72 (6): 4. June 1992. ^ "From the Editor". The Linking Ring. The International Brotherhood of Magicians. 70 (1): 52. January 1990.